Improve the appearance of your property. An ugly old stump has negative curb appeal. Make it easier to cut the grass. You’ll also avoid accidental damage to your mower and other lawn care tools. Level the ground for a new deck or a home addition. Eliminate a tripping and splinter hazard. You don’t want kids to get hurt playing on your property – nor do you want a lawsuit on your hands if someone falls. Make room for a flowerbed or retaining wall. This is especially important if your yard is on the small side. Protect your plumbing pipes. Did you know that roots may continue to grow even after the tree trunk has been cut down? Their underground activity may cause burst pipes and major plumbing headaches. Protect your other trees and plantings. The stump of a tree that fell (or was felled) due to disease or infestation can still infect other trees and plantings in your yard. 1. Let it rot. If you’re in no hurry, a simple, natural (and cheap!) solution to how to remove a tree stump is just letting it rot. Help the process along by drilling holes in the top and sides. Add nitrogen-rich fertilizer, plus some water and mulch, and leave the stump to be consumed by fungi. Dampen regularly for best results. 4. Dig it out. 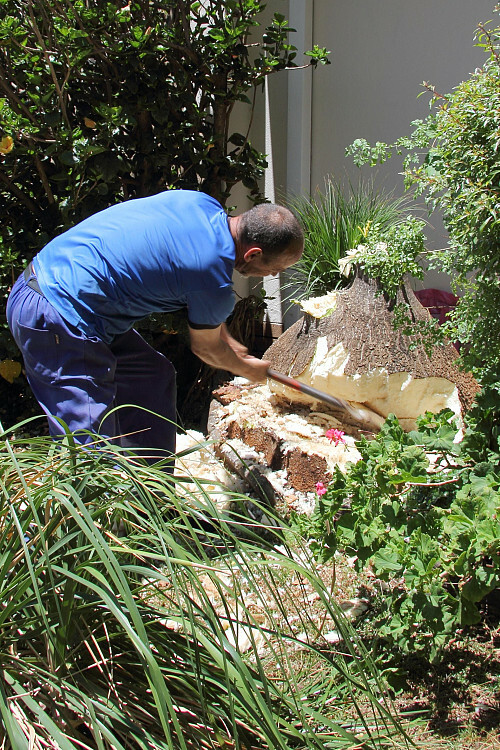 A small stump can often be removed by hand – you’ll just need to invest some major elbow grease. First, dig around the stump and hose down the site to locate its roots. Use an ax or saw to chop off the root system. Try wiggling the stump to see whether it budges. Continue chopping those roots until the stump moves readily. Then dig under the stump to get it out completely. 5. Hire a pro to grind it. When you need to get rid of a tree stump fast (for example, you’re planning to build in that location), a qualified landscaper can remove it quickly and cleanly with a professional stump grinder. This machine is equipped with a spinning steel wheel, whose teeth will turn your stump into a pile of wood chips -- great for mulching the garden! A pro can maneuver the stump grinder even in tight spots and won’t tear up your yard.